A 3-foot square image of this quote, attributed to Pablo Picasso, was propped up in a shop window on a busy street in Atwater Village. It was likely intended to lead one into the shop where, so inspired by the quote, you would also discover gifts to purchase for the holiday season, gifts to give away to your friends and family. The meaning of life, or at least the holiday season. The power of the quote stopped me in my tracks, and I found a shady spot on the sidewalk to copy down the words in my phone, tears welling up in my eyes as I thought about the purpose and meaning of life, and all that everyone gives for the work we support in Congo. Gifts wrapped, given, and opened, this quote stayed with me as I reflected on a year drawing to an end, and the anticipation of all a new year holds. 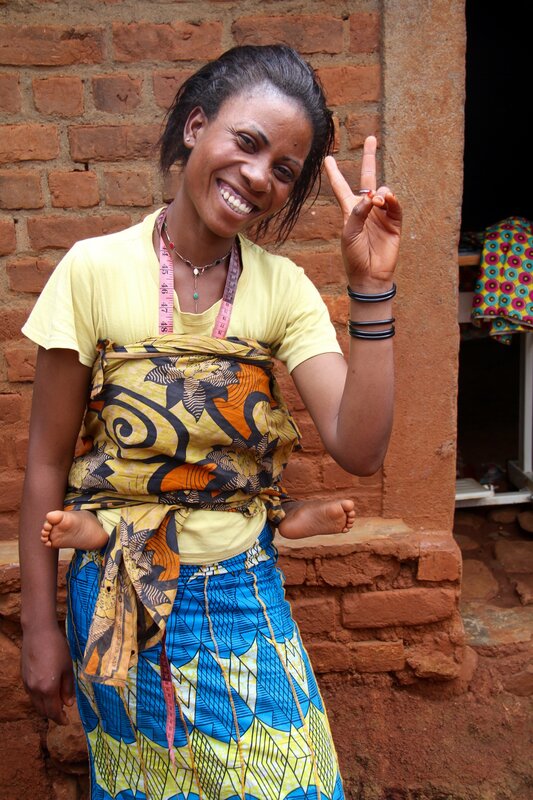 When I think about the changes I’ve seen since co-founding Action Kivu in 2010, when Cate Haight and I began reaching out to all of you to support Amani Matabaro’s work in Congo, I think of Francine, whom I met on my last visit to Mumosho, DRC this past February. I first encountered Francine at the Community Center, where she was practicing the art and craft of basket weaving, wanting to add another skill to her business that she started after she graduated the Sewing Workshop in 2016. Asking if I could see her sewing studio, she invited us to her family’s house, where she had set up shop in a room of her own. Your partnership with Action Kivu and the women and kids of Congo isn’t just changing lives, it is changing the very culture of Congo. As these women embrace their equality and power, they will raise up a new generation to do the same. As we reflect on the amazing changes we witnessed in 2017, from our farm program giving the land and education for 85 women to learn the latest organic farming techniques from a university student and feed their families and community, to our Sewing Workshop graduating 42 skilled entrepreneurs this December, to our Literacy Program welcoming women denied an education from ages 15 to mid-60s, we celebrate an amazing year filled with challenges and successes. We look forward to 2018, a year in which the Congo Peace School will finish construction thanks to the seed money from The Dillon Henry Foundation and a generous donation from the Pour Les Femmes fund. In the coming year, we will continue to raise funding for the additional costs of furnishings, a computer lab, and operating costs to educate the future leaders of Congo in peace and nonviolence. 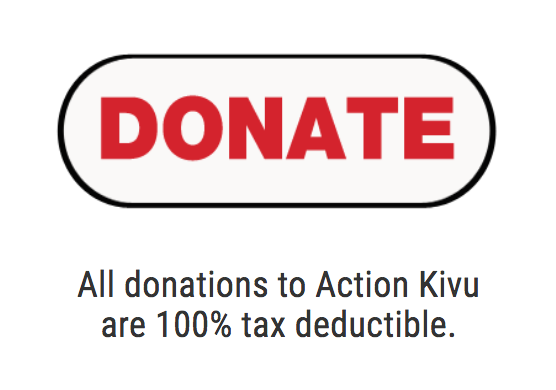 A heartfelt thank you to YOU, our dear Action Kivu family, for giving away your gifts of generosity that make it possible for these women and kids to discover their gifts, develop them, and find meaning in giving them away as they go out and change our world. 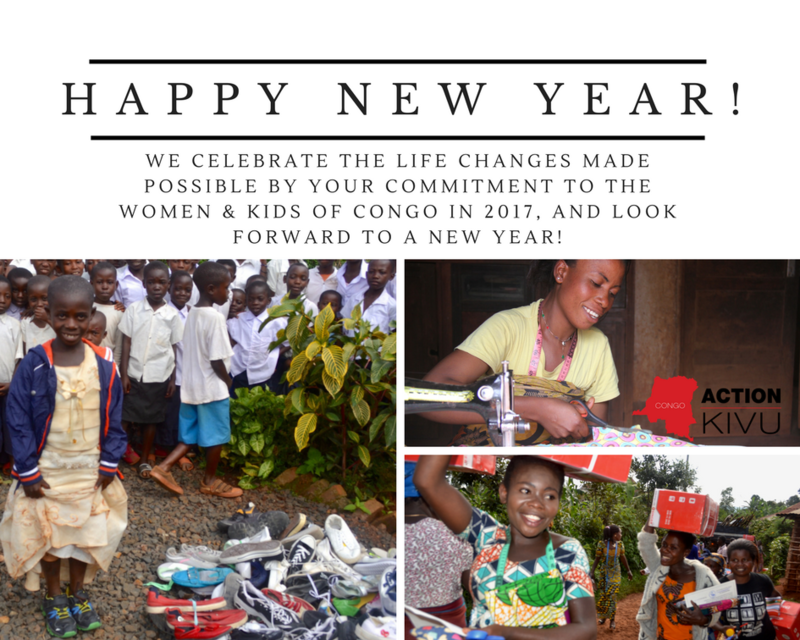 It’s not too late for a year-end donation online, or to set up a monthly donation that allows us to plan ahead as we deepen our impact in the lives of women and children in Congo, and all the people they influence. We are grateful for all you do to invest in this life and culture changing work!